This is some pretty things in my world. The weed flower and leaves turned into pretty colors. The huge spider web shines in the sunlight, and on the same day, we had amazing sky displays which made me happy. A splendid collage. Awesome spider web capture! The spider web caught me and pulled me in! Absolutely gorgeous! I do hope you will share these beautiful finds with I Heart Macro… that spiders web is amazing! 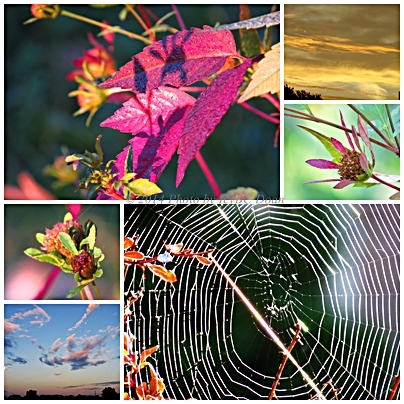 Love the spider web ~ great shot and lovely montage of photos! Love that web! Lovely shots. Awesome images and mosaic.. I love the web and the leaves.. Have a happy week! Beautiful photos. So full of light and liveliness. Weaving and spinning, spinning and weaving. And we become one of the stories.